Nifty Futures closed at all time high on Thursdays trading session. However still the overall market is in short term balance between 9300-9380 range since 26th Apr 2017 and consolidating for the last 6 trading sessions. 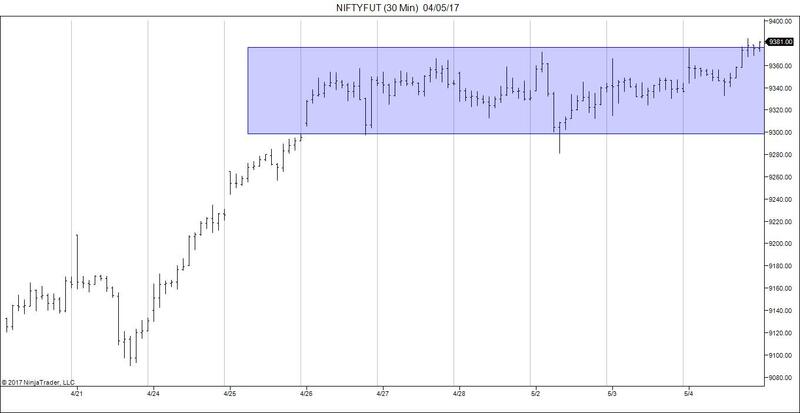 Nothing much changed from the last top down analysis on nifty futures. Volatility in the market remains muted and banknifty is outperforming nifty future heavily in the past few trading sessions. Price managed to close at 5 day breakout and breakout is not aggressive though. However it is able to marginally break above previous weekly and monthly high. On Thursdays trading session price opens within the previous days range and we had seen a nice balanced profile with value area and Point of Control shifted higher. Though price ended higher, POC failed to migrate higher along with price which indicates that we are dealing with short term inventory went from long to too long. 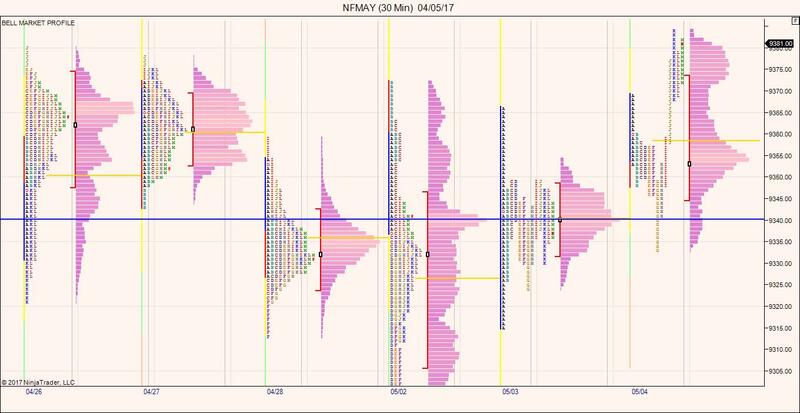 Thursdays trading Nifty Futures failed to accept below the prev days POC at 9340 followed by stop hunting in the second half of the market. It is natural for the market to show stop hunting especially when the day timeframe speculators are coming and dominating/competing in this market. 1)Price opens gap down as the inventory went from high to too high. This could bring some correction towards 9260-9267 zone. 2)Price opens below the Prominent POC and acceptance below 9340 could again bring some correction towards 9260-9267 zone. will target nifty towards the other side of the balance – 9300 ZONE.